look at word "Office". I think that looks little different (apart). I think there is something to this. 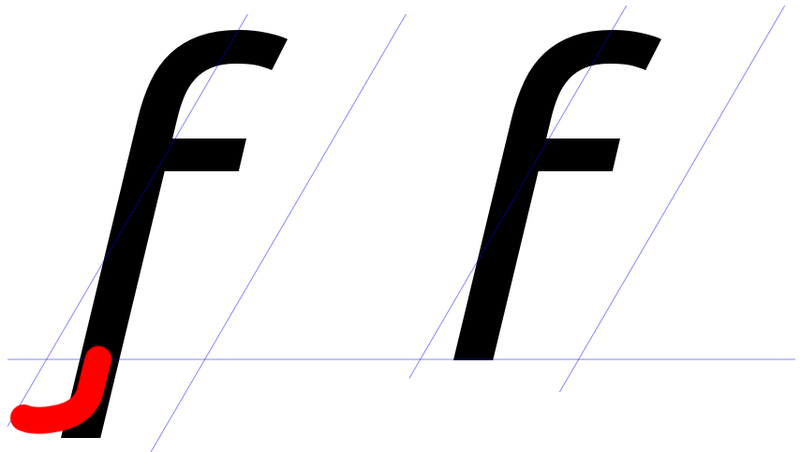 baseline, like a real Olde English f, but it's just straight. very late in the game on this front. DM? The shape of the italic 'f' is ultimately is a stylistic decision rather than a technical bug. However, I also see it as having merit and I too would like to see the 'f' tested with a backwards curve on the descending tail (which is what my eyes are expecting to see). Again, I don't think the existing glyph should be thrown away completely, and regardless of the outcome, could be kept as an alternative (or vice-versa). The final default shape of the 'f' is however something would probably have to be decided upon before the first widely tagged/distributed release (when effectively the Latin metrics get set in stone) as the negative x on the tail will likely affect those metrics. DM: per Mark's request, can you try a full-curvaceous tail on the italic 'f' to balance the top of the character. Thank you for your comment. This comment refers to the style of the font. Stylistic comments are subjective in nature and will be marked as wish list items to be reviewed as part of a future round of development. Ubuntu Beta testing is focussed on finding and reporting technical bugs within the font. wrong way. We missed that on the first stylistic review. This /does/ need working out before opening as the character of the glyph will likely have an impact of metrics, kerning and ligature tables. This illusion of the forward learning 'f' has been corrected in version 0.67. This was achieved with a subtle backflick. "Double-stacking" this bug report, as the Ubuntu Light Italic still needs this change.